It is always wonderful to share my love of art with children in the classroom. And it always seems to me that the best way to share the excitement of art is through people’s own creativity. This morning I am off on the train to Manchester to begin work on the transformation of Lily Lane School. There is going to be a complete makeover of the outdoor space led by Julia Clark, a visionary Headteacher. I worked previously with Julia on the makeover of Horniman School in Lewisham. We more than doubled the amount of outdoor space available to the children, and created new additions such as an outdoor stage and a new front entrance based on children’s drawings of the views from the school. Our last project was to create a cycle powered radio station. Today, I have been invited up to Manchester to select, together with the children on the School Council, the winners of a competition of model designs for a new Tree House. The winning entries will form the basis of final designs. I then designed a version of this tree house which could actually be created in the school grounds. Working with Dave Harold, a local craftsman, the Tree House has been built. Together with improved classroom access to the outdoor space, it is functioning addition to the early years play environment. 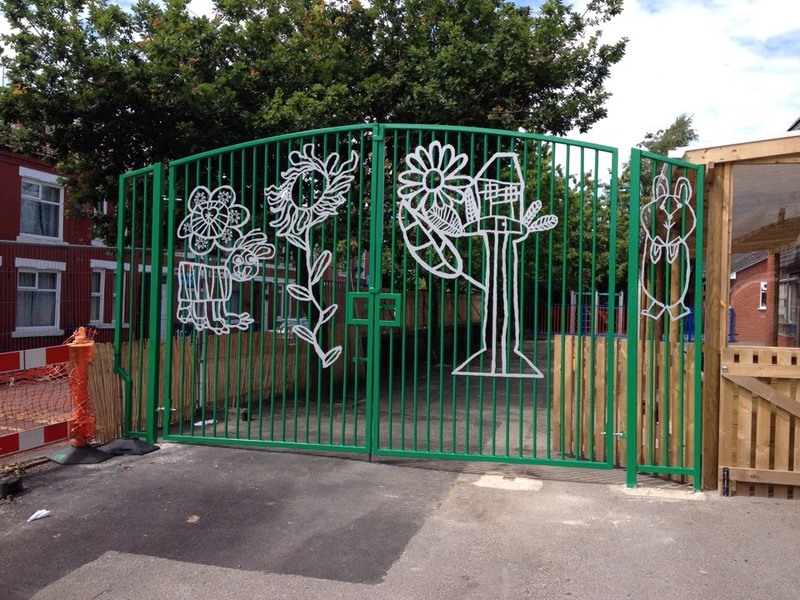 Next, I led a series of workshops with children in years 2, 3, and 6 to create artwork for the fence and new gates. Here are some examples. The artwork had to be done as strong contour drawings, to enable them to be used for laser cutting metal. Here are some selected examples. Some of the drawings have been combined to create a design for the new entrance to the Early Years area. The drawings will be laser cut in steel and welded in place. 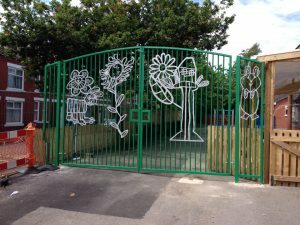 But most importantly, the children should recognise their own artwork in the finished gate. The Manchester Gate Company has been appointed and are undertaking creating this gateway right now. Work now is continuing on creating a new pedestrian entrance to the school, and designs once again will be incorporating drawings created by children at the school. This is in addition to a new extension to the perimeter fence and a new main feature entrance to the school. Below are some of the sketches, which have just been submitted for planning approval. Further updates will follow as these designs start to be transformed into reality. 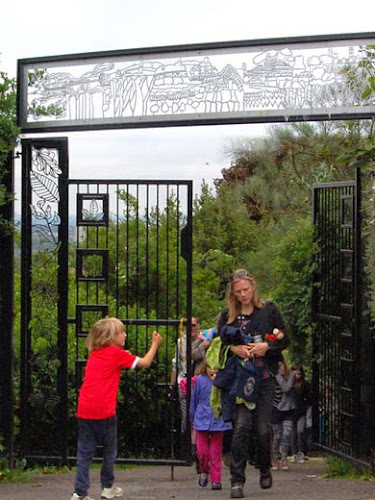 And this is what the new Nursery Gate has come out like. When planning approval was granted, work could begin on creating the designs for the outside of the school. There will be a wavy rail which will hold individual drawings cut in steel. Here is a photograph of a prototype to try out this idea. Part of the transformation of the school includes a new entrance. 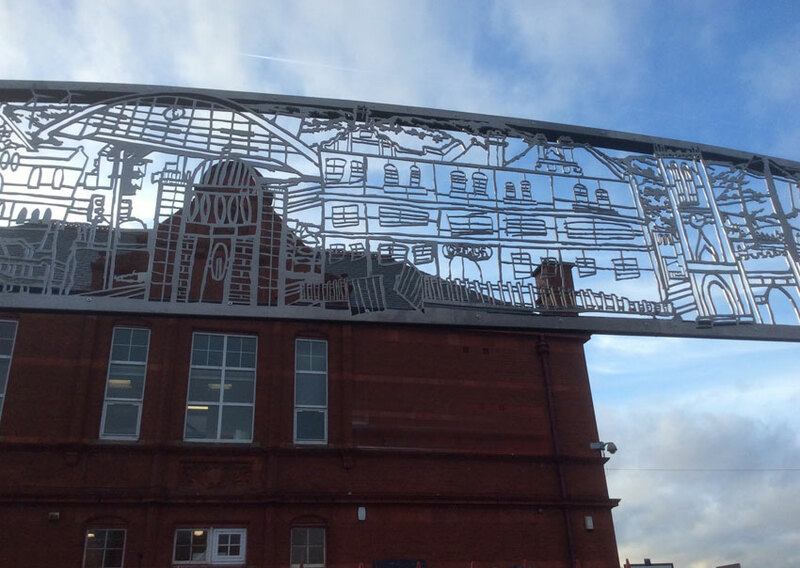 This will be marked with a main feature panorama above, made up of many children’s drawings of iconic buildings in Manchester. 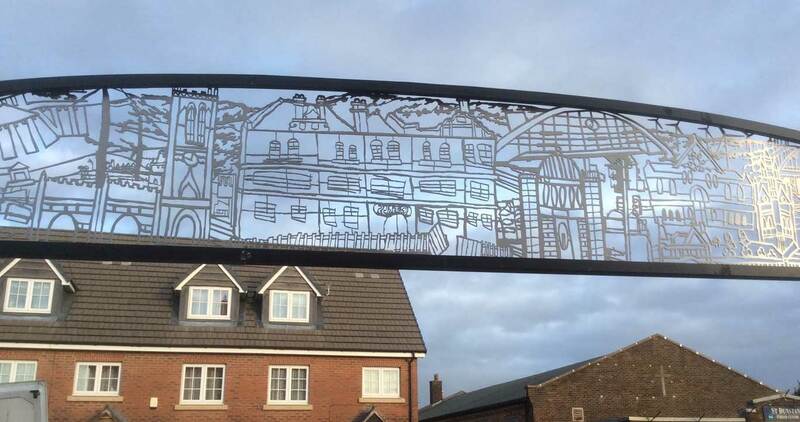 These drawings have been combined into a single design and cut in stainless steel. Below is the final panorama which the children will walk under every day. They should be able to recognize their own artwork in the final design. This will give a sense of ownership and pride as well as inspiring the children’s creativity.